Last week Michael and I ran some new toys by Cora to see if she would like them. It is so funny to see her reaction to different things. Here are the results . . . The bear from her Abuelo was pretty delicious . . . The blanket also had a wonderful taste . . .
Not so sure about the phone rattle . . . But she warmed up to it . . .
and became a regular chatty kathy! She also enjoyed a riveting game of "super baby"
Last weekend Michael and I celebrated our one year wedding anniversary! I cannot believe it has been a year already! On Saturday we got to go to Michaels cousin's wedding that was in the same church that we were married in! It was a really cool way to celebrate. 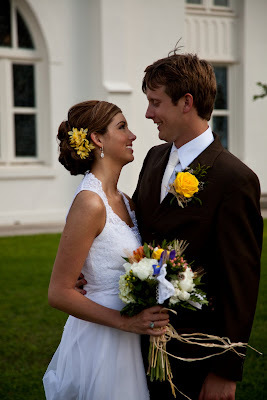 Ryan and Erin had an absolutely beautiful wedding. This is the only picture I managed to snap inside the church, I was occupied most of the time with our itty bitty wedding guest . 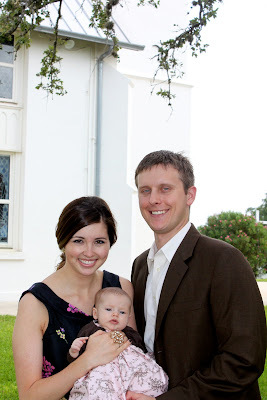 . .
We had a little family photo session outside the church, in the same spot we took our wedding pictures a year ago . . . Us with the happy couple and the not so happy Cora . . .
She loves her aunt Casey!! Surprisingly, Michael somewhat held it together during the daddy-daughter dance! She got to meet Father John for the first time . . .
Sunday was our actual anniversary. We went to church in the morning and then to Olive Garden afterward, my favorite!! We spent the rest of the day relaxing at home and it was fabulous! After we got Cora off to bed, we had sushi and wine and a taste of our wedding cake! It had a bit of a strange aftertaste, but it held up pretty good for being frozen for a whole year! 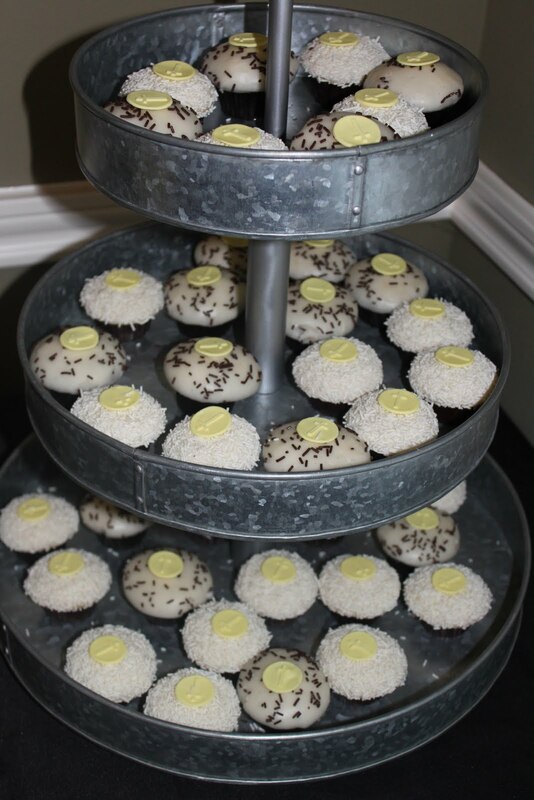 We actually didn't have a chance to try it at our real wedding, we are not big cake people, but it was fun to finally sample it! We exchanged gifts and reflected back on what has been a truly unbelievable year! I love Michael so much more than I did a year ago and I am so honored that I get to spend the rest of my life with such a wonderful man! Little Miss Cora Rose is two months old!! As a first time mom who is learning everything as I go along, I can say that the second month was much smoother. I feel like Michael and I are getting the hang of this whole being parents thing. That is probably good since Michael says that he just can't get over how cute she is and wants at least 18 more. Yup, we are just a shocking reality show waiting to happen. I am gaining a lot more confidence as a mom. Some days I even manage to clean the apartment and do the dishes/laundry, a huge accomplishment in my book at the moment! But enough about mommy stuff, I will move on to the real star of the show! She is growing like a weed!! We haven't been to the doctor yet so I don't have her official stats, but I will next week. Sleeping is going much better. She sleeps in her bassinet for at least 5 to 6 hour stretches, wakes up to eat, and then usually goes back down for another three hours. She isn't very consistent, sometimes she sleeps 7 hours, and there are still nights that she eats every three hours. This last trip she even slept through the night in her pack n play, a huge milestone! She naps a lot during the day in her bouncy chair that she is borrowing from Abigail. We usually wrap her up in the super soft quilt that her Grams and Pops gave her . . . It is nice to be able to put her down and have some time to get things done around the apartment while she sleeps, but my heart still skips a beat with excitement every time I see her little eyes peeking out when she is ready to wake up . . .
And when she is awake she is SO. MUCH. FUN! Her smile is to die for! And now she smiles as a reaction to us, not just as a reaction to the gas bubbles in her tummy. It is incredible to be able to really interact with her! Just look at this little heart melter . . .
She has many delightful facial expressions . . .
And some that are not so delightful, but still marvelous . . . I live for precious moments like this one . . . I don't know where I would be without these two. Also this month, Cora threw her first temper tantrum! We were on our way home from San Antonio, I was driving and Michael was in the back seat with Cora. Usually she NEVER cries in the car and sleeps the whole time, but boy oh boy was this trip different. Just as we were approaching Bastrop, the little princess decided that she did not care to be in her car seat anymore. She looked Michael straight in the eye and started screaming. Not crying, screaming. She would scream until she let all her air out, stop, and then do it again, all the while staring Michael down. We had never heard her make such sounds! I was crying because she sounded so desperate, but I was also laughing because she was so determined. It was devastating slash hilarious. We pulled over and I fed her and all was well. I think we have a strong willed little lady on our hands. And now here she is to fill you in on the world from her point of view . . . When mommy and daddy say "OOOOOOHHHHH"
Last weekend was another fun filled weekend at home. We left Friday afternoon to make it to the Dripping Springs v. Smithson Valley baseball playoff game. Michael and I have strong ties to each school so Cora had some difficulty deciding what to wear. After much thought, she settled on a Dripping Springs headband and an SV outfit . . .
A little mismatched, but VERY cute!! We stayed at Michael's parents house that night, and Abbey, Joe and Casey's niece, was spending the night too! 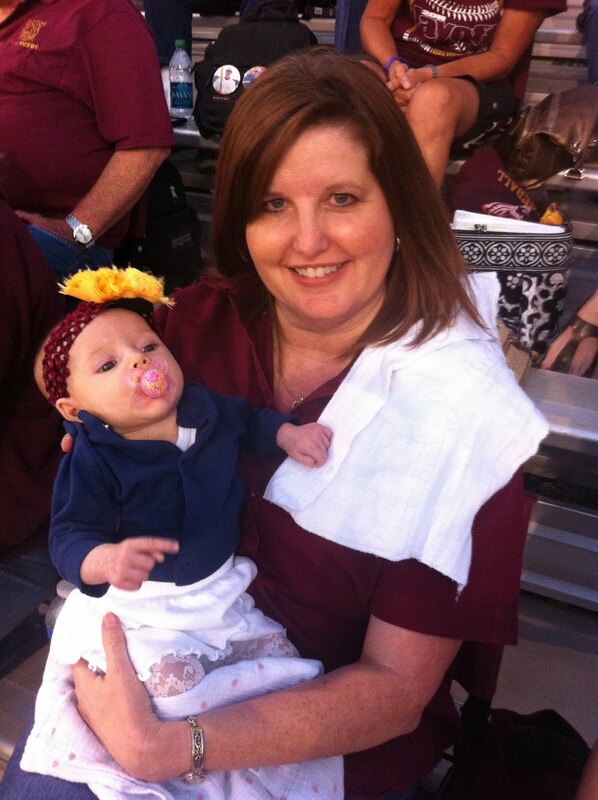 It was so sweet seeing her with Cora! She says the darndest things, just look at that adorable smile . . . The next morning we got up early to go to my parent's house for the third annual Wild Game Dinner (aka my dad's camo party). All the guys from my dad's lease get together and cook all the things they shot that year. Its always a good time! You can check out Barry's blog to see all the food they made. I had NO part in the food prep so I really can't tell you much. 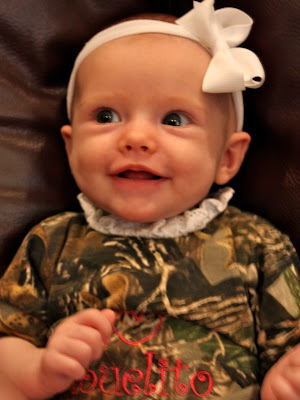 But I can tell you about how cute Cora looked!! 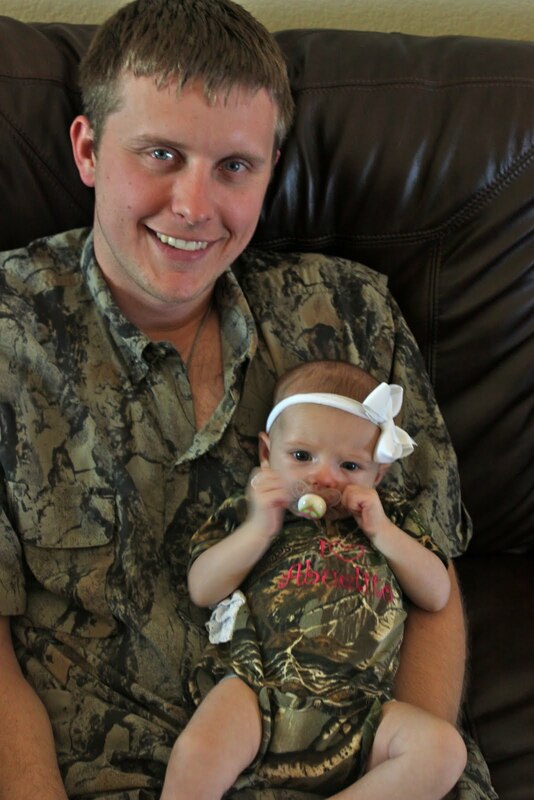 My dad bought her a camo onesie long before she was born just for this specific occasion. Our friend Kristi embroidered it to personalize it for my dad and it turned out to be super precious . . . The day was absolutely beautiful so we spent it outside, mostly being entertained by Abigail. She is the most hilarious person I know! I could watch her for hours! It will be so fun when Cora is old enough to play with her. The Udells are such a fun family! Abigail is SO active . . .
Cora, not so much . . . The boys were cooking all day . 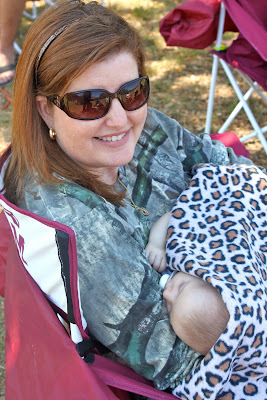 . .
Abigail loved her mini tailgating chair, she actually stayed in one place for more than 5 minutes! And now for some family camo pics . 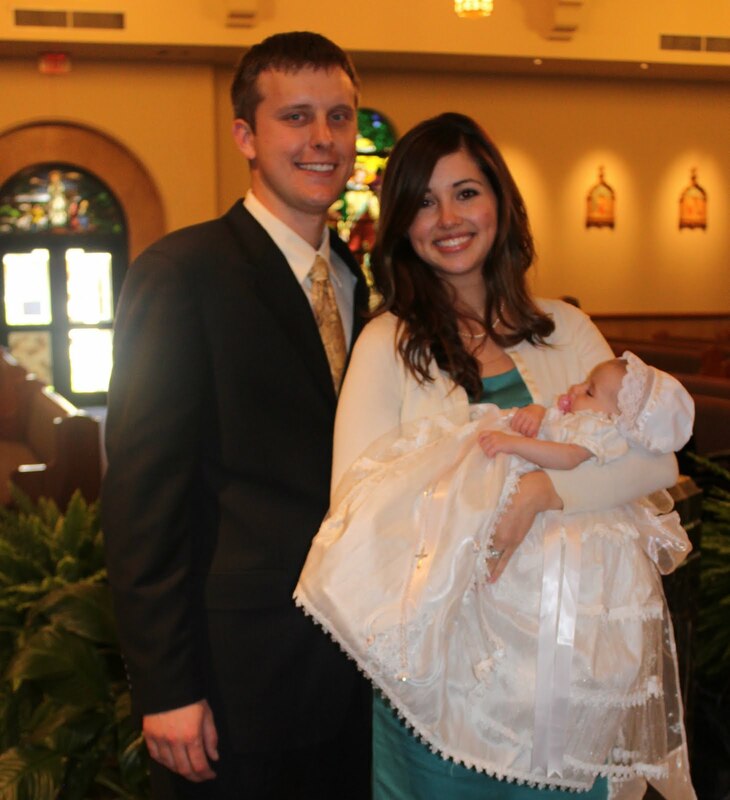 . .
Last Saturday we celebrated Cora's baptism! It was a day I had dreamed about since I found out I was pregnant and it was absolutely perfect. We had the ceremony in Sealy at Father Eric's church and the reception at Tara's house. It was so nice of her and Barry to open up their home to us once again! It was such a special day, and the best way I can explain it is through the following zillion pictures (thank you to Casey for being such a fab photographer) . . . 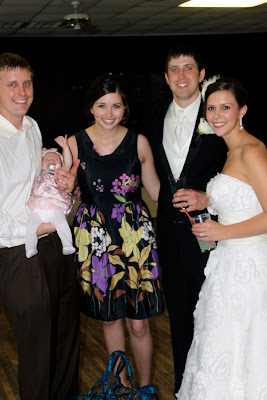 Her Godparents, Kristin and Joe got her dressed in her beautiful baptismal gown that my grandma bought for her! It was such a sweet moment to see them get her all ready. Joe did a great job tying the bow! Proud parents before the ceremony . . .
Father Eric did a wonderful job as usual. The baptism was everything I had hoped it would be and more, it was so emotional to see our little baby girl becoming a member of the Church in front of all our family and friends . . . Speaking of family and friends, we were truly amazed to see how many people made the trip down to Houston to support us, and on Mother's Day weekend!! We feel SO blessed to have so many people that care about us and Cora so much . . .
Our good friends Claire and Daniel came down from Dallas with their adorable son Charlie, AKA Cora's boyfriend and future husband . . .
Cake made by Kristin and Jeff! AND, another bit of exciting news, Kristin and Jeff told me that I am going to have the honor of being the Godmother for their little girl Julia!!! I am OVER THE MOON about it!!! They left me a sweet card from Julia that they said I was supposed to open on Mothers Day, but of course I opened it shortly after they left! I can't wait until she gets here! I guess that means that her and Cora will be cousins, bffs and Godsisters!